Sugar Shack puts a fun little twist to the traditional brew! All parties are 1½ hours. A minimum of $125 required for booking a party. We've redesigned our site and the website for our sister company Sweet Peace Yoga. The old design was great but this one should be faster and easier to navigate for our friends on the go! Pardon our dust! 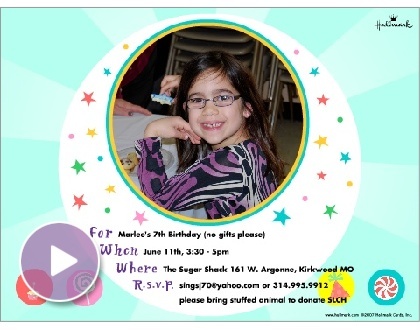 Marlee's 7th Birthday June 11 at 3:30 pm at Kirkwood Sugar Shack. Please bring a stuffed animal to donate to St. Louis Children's hospital. Click above for your fun invitation! Who doesn't love candy buttons? Local St. Louis fav and KTRS personality JC Corcoran stopped by the Sugar Shack then featured us on on JC's Daily Dose! Who doesn't love candy buttons? Who doesn't love JC! 12:00 p.m - 8:00 p.m.
Sugar Shack is open from 12 noon to 4 p.m. on Labor Day. Also look for our fall schedule soon! 12:00 p.m - 9:00 p.m.